Lipoid proteinosis is a rare autosomal recessive genodermatosis characterized by the deposition of an amorphous hyaline material in the skin, mucosa, and viscera. The classic manifestation is onset in infancy with a hoarse cry due to laryngeal infiltration. Skin and mucous membrane changes become apparent clinically, and the disease typically follows a slowly progressive, yet often benign, course. Virtually any organ may be involved, but visceral involvement rarely leads to clinically significant consequences. The exceptions are involvement of the central nervous system and respiratory tract, which may result in seizures and airway obstruction, respectively. Lifespan is otherwise normal. Lipoid proteinosis has been linked to mutations in the gene encoding extracellular matrix protein 1 (ECM1). [1, 2, 3] To date, no effective treatment is known. Adult male with lipoid proteinosis. His leonine facies appearance is a result of diffuse skin infiltration. Courtesy of Kenneth E. Greer, MD. Lipoid proteinosis is a rare genodermatosis inherited in an autosomal recessive pattern. Clinical features are myriad, and the literature describes considerable variation in severity between affected patients. Heterozygous carriers have an apparently normal phenotype but may have subtle changes such as abnormal dentition. In 2002, loss of function mutations in the gene encoding extracellular matrix protein 1 (ECM1) on band 1q21 were identified as the cause of lipoid proteinosis. [1, 4] Frameshift and nonsense mutations have been described throughout the gene, although exons 6 and 7 seem to be the most common locations. Mutations at these particular sites appear to have genotype-phenotype relevance. Patients with exon 7 mutations display slightly milder clinical features, while mutations in exon 6 result in a more severe phenotype. The ECM1 gene product is a glycoprotein with functional roles in skin physiology and homeostasis. ECM1 is involved in keratinocyte differentiation in the epidermis and in regulation of basement membrane integrity, interstitial collagen fibril macroassembly, and growth factor binding in the dermis. The disease is characterized by deposits of hyalinelike material in skin, mucosa, and viscera and is also referred to as hyalinosis cutis et mucosae. The original designation, lipoid proteinosis, refers to the histologic features of the deposited material, which shows similarities to both lipid and protein, although no abnormalities in lipid metabolism have been identified. ECM1 proteins are also expressed in a number of other tissues, including the placenta, heart, liver, small intestine, lungs, ovary, testes, prostate, pancreas, kidneys, skeletal muscle, and endothelial cells. Its role in wound healing, scarring, and aging is speculated but not yet defined. The loss of normal function of ECM1 in lipoid proteinosis is associated with a wide range of clinical abnormalities due to infiltration of the skin and viscera with hyalinelike material. The histological correlate is diffuse dermal deposition of hyaline material, basement membrane thickening at the dermoepidermal junction and around adnexa and vessels, and epidermal hyperkeratosis. These findings suggest the strong influence of ECM1 on both epidermal and dermal physiology. The eosinophilic hyaline material is deposited in all affected organs, although whether this is a primary or secondary phenomenon is unclear. The details of the genotype-phenotype correlation regarding the nature of the hyaline deposits are currently under investigation. More than 300 cases have been reported worldwide. Incidence and prevalence figures are not available. Patients of European ancestry are most commonly affected, including South African descendants of German or Dutch immigrants. Large kindreds from South Africa have been traced back to a single German male who settled in South Africa in the 17th century. Patients typically present in early childhood, but manifestations may be present at birth. Some cases may occur in adults. Adults may have subtle skin findings and may present with complications due to visceral deposition. The presence of this disease is compatible with a normal life span unless altered by airway obstruction or fatal seizure activity. Mortality rates in infants and adults are slightly increased because of laryngeal obstruction. Patients with significant airway compromise may require permanent tracheostomy. The parents should be educated about the risk of having affected offspring. Hamada T, McLean WH, Ramsay M, et al. Lipoid proteinosis maps to 1q21 and is caused by mutations in the extracellular matrix protein 1 gene (ECM1). Hum Mol Genet. 2002 Apr 1. 11(7):833-40. [Medline]. Hamada T, Wessagowit V, South AP, Ashton GH, Chan I, Oyama N, et al. Extracellular matrix protein 1 gene (ECM1) mutations in lipoid proteinosis and genotype-phenotype correlation. J Invest Dermatol. 2003 Mar. 120(3):345-50. [Medline]. Izadi F, Mahjoubi F, Farhadi M, Tavakoli MM, Samanian S. A novel missense mutation in exon 7 of the ECM1 gene in an Iranian lipoid proteinosis patient. Genet Mol Res. 2012 Nov 14. 11(4):3955-60. [Medline]. Nasir M, Latif A, Ajmal M, Qamar R, Naeem M, Hameed A. Molecular analysis of lipoid proteinosis: identification of a novel nonsense mutation in the ECM1 gene in a Pakistani family. Diagn Pathol. 2011 Jul 26. 6:69. [Medline]. [Full Text]. Kabre V, Rani S, Pai KM, Kamra S. Lipoid proteinosis: A review with two case reports. Contemp Clin Dent. 2015 Apr-Jun. 6 (2):233-6. [Medline]. Hamie L, Knio Z, Abbas O, Akel R, Bardawil T, Kibbi AG, et al. Clinical clues early in the lives of individuals with lipoid proteinosis can determine the course of the disease. Clin Exp Dermatol. 2017 Feb 28. [Medline]. Gutte R, Sanghvi S, Tamhankar P, Khopkar U. Lipoid proteinosis: Histopathological characterization of early papulovesicular lesions. Indian Dermatol Online J. 2012 May. 3(2):148-9. [Medline]. [Full Text]. Arkadir D, Lerer I, Klapholz L, Halpert M, Newman JP, Gomori JM, et al. Lipoid proteinosis with bilateral amygdalae calcifications, headache, and cognitive impairments. Neurology. 2013 Jul 16. 81(3):303-4. [Medline]. Salih MA, Abu-Amero KK, Alrasheed S, Alorainy IA, Liu L, McGrath JA, et al. Molecular and neurological characterizations of three Saudi families with lipoid proteinosis. BMC Med Genet. 2011 Feb 24. 12:31. [Medline]. [Full Text]. Xu W, Wang L, Zhang L, Han D, Zhang L. Otolaryngological manifestations and genetic characteristics of lipoid proteinosis. Ann Otol Rhinol Laryngol. 2010 Nov. 119(11):767-71. [Medline]. Callizo M, Ibáñez-Flores N, Laue J, Cuadrado V, Graell X, Sancho JM. Eyelid lesions in lipoid proteinosis or Urbach-Wiethe disease: case report and review of the literature. Orbit. 2011 Oct. 30(5):242-4. [Medline]. Frenkel B, Vered M, Taicher S, Yarom N. Lipoid proteinosis unveiled by oral mucosal lesions: a comprehensive analysis of 137 cases. Clin Oral Investig. 2016 Nov 29. [Medline]. Bai X, Liu JW, Ma DL. Novel Mutations in Extracellular Matrix Protein 1 Gene in a Chinese Patient with Lipoid Proteinosis. Chin Med J (Engl). 2016 Nov 20. 129 (22):2765-2766. [Medline]. Chan I, South AP, McGrath JA, Oyama N, Bhogal BS, Black MM, et al. Rapid diagnosis of lipoid proteinosis using an anti-extracellular matrix protein 1 (ECM1) antibody. J Dermatol Sci. 2004 Aug. 35(2):151-3. [Medline]. Kaya TI, Kokturk A, Tursen U, Ikizoglu G, Polat A. D-penicillamine treatment for lipoid proteinosis. Pediatr Dermatol. 2002 Jul-Aug. 19(4):359-62. [Medline]. Wong CK, Lin CS. Remarkable response of lipoid proteinosis to oral dimethyl sulphoxide. Br J Dermatol. 1988 Oct. 119(4):541-4. [Medline]. Dertlioglu SB, Calik M, Ciçek D. Demographic, clinical, and radiologic signs and treatment responses of lipoid proteinosis patients: a 10-case series from Sanliurfa. Int J Dermatol. 2013 Dec 10. [Medline]. Akoglu G, Karaduman A, Ergin S, Erkin G, Gokoz O, Unal OF. Clinical and histopathological response to acitretin therapy in lipoid proteinosis. J Dermatolog Treat. 2011 Jun. 22(3):178-83. [Medline]. Kroukamp G, Lehmann K. Treatment of laryngeal lipoid proteinosis using CO2 laser. S Afr Med J. 2007 Feb. 97(2):90, 92. [Medline]. Characteristic beaded papules on the eyelid (moniliform blepharosis). Courtesy of Kenneth E. Greer, MD. Waxy, yellow skin thickening and atrophic scarring. Courtesy of Kenneth E. Greer, MD. Beaded papules on the upper labial mucosa. Courtesy of Kenneth E. Greer, MD. Woody induration and depression of the tongue. Courtesy of Kenneth E. Greer, MD. 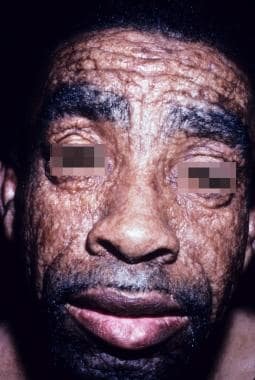 Waxy, infiltrated, yellowish skin with depressed, atrophic scarring. Courtesy of Kenneth E. Greer, MD. Waxy skin with atrophic, depressed scars on the forehead. Courtesy of Kenneth E. Greer, MD. Infiltrated, thickened skin with atrophic and hyperpigmented scarring in 2 brothers with lipoid proteinosis. Note the tongues, which are firm and woody, ulcerated, and unable to be completely protruded because of infiltration of the frenulum. Courtesy of Kenneth E. Greer, MD.